Judith Lynn Morely was born on December 26, 1939, in Evanston, Illinois, youngest of two daughters of William Morely, an accountant, and Helen Hall Morely, a department store clerk. She grew up on the north side of Chicago in a heavily Irish–Catholic and Democratic neighborhood and attended public schools. Her earliest political experience was in running for eighth–grade class president against her boyfriend. “I lost by one vote. My vote. You see, I voted for my opponent because I thought it was polite,” she recalled years later. “Well, he voted for himself, and I learned my lesson: if you believe in yourself, vote for yourself.”2 She made Phi Beta Kappa and earned a B.A. in English at the University of Illinois at Urbana in 1960. A week after she graduated she married John Martin, an engineering student. They raised two daughters, Julia and Caroline. Lynn Martin taught at several high schools in DuPage County and Rockford, Illinois. Martin entered public service after becoming “interested in my community” and worried that the local government was “out of touch” and “buried.”3 In 1972, Martin was elected to the Winnebago County (Illinois) board and four years later won a seat in the state house of representatives. Her political mentors were Betty Ann Keegan, a Democrat in the Illinois state senate who first encouraged her to run for office, and Republican Congressman Robert Michel of Illinois, the future U.S. House Minority Leader. There she served on the appropriations committee and earned the nickname “the Axe” for her efforts to reduce spending.4 Martin won election to the Illinois senate in 1978. That same year she and John Martin were divorced. Lynn Martin eventually remarried in 1987 to Harry Leinenweber, a U.S. District Court judge. 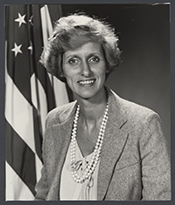 Martin distinguished herself on several other committees, serving on House Administration (1981–1985), Public Works and Transportation (1983–1985), Armed Services (1985–1989), and Rules (1989–1991). On a number of important issues she parted company with Republicans: arguing for a minimum wage increase, voting to override President Reagan’s 1986 veto of a sanctions bill against the apartheid regime in South Africa, joining with Democrats to stiffen punishment for white–collar criminals, and supporting pro–choice legislation. Martin’s supporters in the party helped her in her postcongressional career. On December 14, 1990, President Bush appointed her Secretary of Labor, despite the fact that she was at variance with the administration on social issues. “I can’t imagine the only people who should work for a President are those who sycophantically agree on everything,” Martin said. “It would be the most boring Cabinet in the world and it would be of no use to the President.”17 She served as Labor Secretary from February 22, 1991, until January 20, 1993, developing several programs: “Job Training 2000” for youth apprenticeships; the Pension Opportunities for Worker’s Expanded Retirement; and the “Glass Ceiling” Initiative. Martin later taught at Northwestern University, worked for Deloitte & Touche’s Council on the Advancement of Women, chaired a University of Illinois task force on “The Future of the Health Care Labor Force in a Graying Society,” and conducted a comprehensive study on sexual harassment in the workplace for a major automobile company.18 She lives in Chicago, Illinois. 1Deborah Churchman, “Illinois Congresswoman Brings Her Frugal Style to Washington,” 8 January 1981, Christian Science Monitor: 17. 2Shirley Washington, Outstanding Women Members of Congress (Washington, D.C.: U.S. Capitol Historical Society, 1995): 57. 4Current Biography, 1989 (New York: H.W. Wilson and Company, 1989): 386. 5Politics in America, 1982 (Washington, D.C.: Congressional Quarterly Inc., 1981): 362. 9Milton Coleman, “Lynn M. Martin: Finessing an Insider’s Game in House GOP Leadership,” 19 May 1986, Washington Post: A13. 10Susan F. Rasky, “Parties Name House Leaders and Goals,” 6 December 1988, New York Times: B13; Clifford D. May and David Binder, “Briefing,” 24 November 1988, New York Times: B15; Almanac of American Politics, 1990 (Washington, D.C.: National Journal Inc., 1989): 382. 12Irvin Molotsky, “House Extends Job Bias Protection To Its Own Workers, With Limits,” 5 October 1988, New York Times: A1. 14Almanac of American Politics, 1994 (Washington, D.C.: National Journal Inc., 1993): 384. 16“Election Statistics, 1920 to Present,” http://clerk.house.gov/member_info/electionInfo/index.aspx. 17Charles Trueheart, “Lynn Martin: No Yes Woman,” 19 August 1992, Washington Post: B1. See also Karen Foerstel, Biographical Dictionary of Congressional Women (Westport, CT: Greenwood Press, 1999): 173–174. 18“Mitsubishi Settles with Women in Sexual Harassment Lawsuit,” 29 August 1997, New York Times: A14. Papers: 1977-1992, 39 cubic feet. The papers of former Congresswoman Lynn Morley Martin contain correspondence, notes, reports, legislation, appointment books, guest books, newspaper clippings, books, magazine articles, press releases, speeches, campaign and office records, newsletters, photos, artifacts and videotapes concerning Martin's tenure in the Illinois House and Senate, including nursing home reform; her campaigns for the U.S. House of Representatives, including finances, election returns, and advertising; her tenure in the U.S. House, including casework, project assistance, legislative and constituent services, letters signed, candidates for the Republican Conference vice chairmanship (1984), the Republican Policy Committee Chairmanship (1987), and the House Republican Conference Chairmanship (1988-89), speech seconding George Bush's nomination at the Republican National Convention (1984), efforts to reform the rules of Congress and to extend civil rights laws to congressional employees, women's issues, labor issues, the federal budget, educational reform, and seminars and conferences; campaign for U.S. Senator (1989-1990), including planning, organization, fundraising, finances, advertising, and debates; tenure as Secretary of Labor, including confirmation hearings, swearing in, and the Glass Ceiling initiative on removing barriers to women and minorities in corporations; photographs with Ronald Reagan and George Bush; and trips to Eastern Europe (1989-1990) and Italy (ca. 1991). An inventory is available in the repository and online. Videoreels and Videocassettes: 1980-1990, 15 commercials on 10 videoreels and 18 commercials on 2 videocassettes. The commercials used during Lynn Morley Martin's campaigns for the 1980, 1984, 1986, and 1988 U.S. congressional elections in District 16 and the 1990 U.S. senatorial election in Illinois, Republican Party. "Lynn Martin" in Women in Congress, 1917-2006. Prepared under the direction of the Committee on House Administration by the Office of History & Preservation, U.S. House of Representatives. Washington: Government Printing Office, 2006. Petri, Thomas E., William F. Clinger, Jr., Nancy L. Johnson, and Lynn Martin, eds. National Industrial Policy: Solution or Illusion. Boulder, CO: Westview Press, Inc., 1984.